That’s all it takes to have your oil changed plus much more at Lewis Express Care. At Lewis Express Care your next oil change will be anything but typical. We include more services than our competitors FREE of charge. Lewis Express Care has been family owned and operated in Cairo, GA since 1994. For 21 years, we have been providing exceptional and SUPER FAST automotive services to Cairo and all of Grady County. Located at 1295 US Highway 84 E in Cairo we are South Georgia’s choice in automotive repair and maintenance services. Call us today or just stop by for any of your automobile maintenance needs. 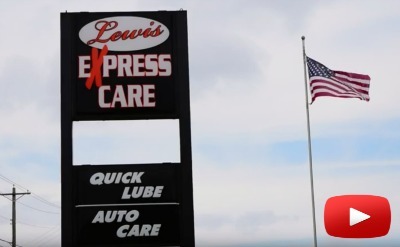 At Lewis Express, we strive to complete each premium service oil change in a timely manner, allowing you to spend time doing the things you enjoy. From drum to disc brakes the highly trained technicians at Lewis Express know your brake system and can perform inspections and replacements on almost every make and model. South Georgia summers can take a toll on your car’s A/C. Make your car icy cold once again. Lewis Express Care is your one stop repair spot for your car’s air conditioning system. Radiator repair and maintenance is essential to the health of your engine and your vehicle. Our expert technicians will assess the state of your radiator and fully service your cooling system. Need a new propane tank? What about a refill on an old tank or even in your RV? Lewis Express Care will have you filled up and ready to hit the road again in minutes. Stop by today. Lewis Express Care now offers all of our services to semi-trucks and RV’s of all sizes. Our over-sized repair bays allow us to handle any of your trucks needs for the long road ahead. Lewis Express offers all of these services plus many more with our highly trained maintenance team and certified mechanics. Bring in your car today for any of your auto repair needs. Stop by our shop today or call and make an appointment for your best convenience. Complete the form below to join our email list and receive special offers every month. Why do you choose Lewis Express?